Many cyclists eeking out their place between other cyclists, busses, streetcars, train tracks, pedestrians, autos and taxis, with a fading sharrow leading our way. Dangerous and intimidating to say the least. But wait - has our call for help (and justice) been answered? This just in: Bikes Belong has selected San Francisco (among 6 U.S. cities) to receive a protected bike lane. 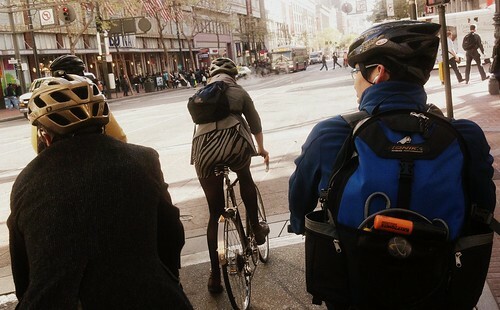 Let us all rejoice (and hold our breath while biking on one of SF's worst streets for cyclists) until our prototype for future bike lanes arrives and some sense is knocked into our administrators' brains when they see how happy and harmonious all commuters are when they each have their own designated space. And by the way, lady, cute mini! Hi Kristen, Streetfilms have just posted a new vid entitled MEDELLIN: Colombia's Sustainable Transport Capital. I think it's a bit of an eye opener! It's worth a look. I mean for cryin out loud, if colombia can swing it then the people who think they know best in San/fran should be able to pull their finger out and get it sorted! Just thought i'd say it how it is. 4 day bank holiday this weekend in the UK, hope yours will be as good as mine. Keep Smilin !!!! !